Pre-order Jesse's brand new album 'Departure' today for only $12.99 and get a FREE SIGNED 8x10 PHOTO! hey everyone- i'm trying to get this webcast working. So many of you have signed in that you guys crashed the server!!! Crazy! SOOO SORRY!! if we can't figure this out soon, we will definitely reschedule! i'll keep you posted. 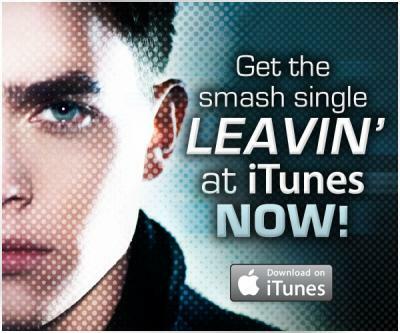 Leavin' on iTunes available Today! Hey what up people? I posted a special song for you called INTRO. It's like a post-21st-birthday present for my fans. It's a bonus track, not on the new CD but it's an introduction to the new CD. Check it out. (You'll have to stop the remix widget before playing it.) Post comments about it and lemme know what you think.